January 1, 2009 will mark the 50th anniversary of the Cuban Revolution. Only two years later, in response to the confiscation of US-owned assets by the Castro regime and to the demands of the growing population of Cuban exiles in the US, the US government introduced policies to isolate Cuba and strangle the Cuban Revolution. After ten presidents, a world-threatening missile crisis and the collapse of its Soviet ally, the Revolution survives, despite the best efforts of Washington and, at times, the Cuban government. The ninety miles that separate Cuba from Florida could be ninety million miles as far as most Americans are concerned. A US travel ban introduced in 1961 limits American contact to Cuban Americans with direct families on the island, journalists and a few others eligible to travel to Cuba under license from the Treasury Department’s Office of Foreign Asset Control. Also, a growing number of US citizens travel to Cuba through Mexico, Canada and other countries that impose no travel bans on its citizens. Visitors to Cuba enter a time warp. The changes imprinted by the Cuban Revolution are largely psychological and institutional, well hidden from the eyes of most tourists who bask on Cuban beaches in all-inclusive resorts that have been, until recently, off-limits to Cubans. Visually, Cuba is frozen in 1959, evidenced by Old Havana’s architectural treasures or the DeSotos, Studebakers and Oldsmobile Rocket 88s that cruise along the Malecón. Cuban baseball borders on fanaticism. To get a taste of the fervor one only has to venture to the heart of Havana’s Parque Central, located caddy corner to El Capitolio (the Capitol building), and into an area appropriately known as esquina caliente (the hot corner). Here, daily, hundreds of Cubans ranging in ages from their teens to their eighties gather to discuss, argue and debate the best and worst of Cuban, as well as American, baseball. To an outsider, this social custom may seem overly passionate, verging on the brink of physical violence. However, this Cuban custom is an outlet for personal expression. And arguing about their beloved baseball is the conduit for such free expression. Almost as a stylized ritual, if one gentleman has had enough or is being out-argued, he throws up his hands and walks off in disgust, all the while muttering his anger to himself and anyone else who might empathize with his position. Two others yell at the top of their lungs over the merits of a certain pitcher, one waving the game stats in the Granma, a Havana newspaper. Onlookers converge around the animated exchange, some piping in, others laughing. You might even see a few wearing Major League caps. The energy and passion are palpable and infectious. No serious hurt feelings however; there’s always the next day’s round of debates. Even those Cubans who don’t follow the sport on a daily basis are emboldened by the prideful nationalism the game evokes. From the hustle and bustle streets of Havana to more rural settings in towns like Viñales and Trinidad, Cubans embrace the sport of baseball even more than the universal sport of soccer. Baseball is a true cultural phenomenon. Kids of all ages play baseball everywhere, from street corners, apartment buildings, parks, alleyways, and every nook and cranny that can provide the faintest semblance of a baseball diamond. Because of Cuba’s perpetual lack of material goods, the country’s children and young adults creatively make do with anything on hand to play the sport they so love. Bottle caps become baseballs. Broom sticks become bats. Flattened cardboard boxes become bases and gloves. I watch Cuban kids hit a bottle cap with a broomstick-bat four times out of five and understand why they don’t have trouble hitting a curve ball or a 90-mph fastball. Nothing can stop them from playing. In Havana, the local “Industriales” team are gods. They are the New York Yankees of Cuban baseball. Whether celebrated or loathed, there’s no getting around the fact that team Industriales is the island’s most successful franchise. Point proven by the fact that in the post-revolutionary Castro era of baseball, the Industriales have reigned supreme and have practically had a monopoly as the winners of most of the Cuban World Series classics. Losses to arch-rival Santiago de Cuba in the finals for the National Series championship over the past two seasons evoke as much discontent as do housing shortages, low wages, and a two-tiered currency system that sees Cubans paid in one currency (Cuban pesos) and shop in another (convertible pesos). The Industriales possess a powerhouse lineup of Big League caliber talent headlined by the “great Mayeta,” Alexander Mayeta. The first base slugger is the perennial superstar who at 31 years of age possesses a swing as powerful as Barry Bonds but with a baby face smile as captivating and heartwarming as Denzel Washington. His affable and approachable personality make him seem more of a friend you’d hang out with throwing back mojitos and puffing on Cohiba’s with at El Floridita instead of the man with the intimidating presence on the diamond. In his storied career, Mayeta has put up Hall of Fame-type numbers that rival the best in the United States major leagues. All around Havana, graffitied walls speckled with the Industriales team logo and scribes of devotion are reminders of the passion and love for the ballclub. An apartment building viewed over the left-field fence of Havana’s storied Estadio Latinoamericano is Instustriales blue with a gothic “I” running the length of its dozen stories. If Havana’s Industriales are the Yankees of Cuba, Havana’s other team, the Metropolitanos, are the St. Louis Browns or the Pittsburgh Pirates. Cuban baseball bans the trading and sale of player: each player plays with his province’s team. The only movement of players between teams is from Industriales to Metros, with such transfers designed to keep Industriales competitive. Cuba has a rich baseball past. The game was introduced to the island in the 1860s and professional baseball started there in 1878, less than a decade after its start in the US. Eighty-seven Cubans, including Adolfo Luque, Minnie Minoso, Tony Perez and Bert Campaneris, played in the major leagues before the Cuban Revolution. Only one of these former major leaguers remains on the island. The elder statesman of Cuban baseball is 97-year old Conrado Marrero who in the early 1950’s spent five seasons in the major leagues pitching for the Washington Senators. Now, nearly blind and spending his sunset years in his modest apartment with his grandson and great-grandchildren in the Cerro district of Havana, Marrero may move slower and his eyes may be clouded by cataracts, but his still feisty spirit and mental recall of his days going up against greats like DiMaggio, Yogi Berra, and Satchel Paige is intact. Marrero won only 39 games in his major league career, but his personality earned him a feature story in Life Magazine in 1951. The top amateur pitcher in Cuba before he turned professional at age 35, Marrero is lionized in Cuba and was depicted on a Cuban commemorative stamp. Attending a professional Cuban baseball game is like going to an impromptu rock concert. Stadiums date from the 1970’s and most seat only a few thousand. Transportation problems plague the island and games other than those between top teams are poorly attended. Those paying the four cent admission to a game make up for their numbers with enthusiasm that makes fans at Wrigley Field or Fenway appear comatose. Fans chant, sing, and play percussive instruments from the first pitch until the end of the game. Unlike sporting events in America, no one leaves until the last out has been made. Teams show up only an hour before game time, dressed in their uniforms, many of them carrying their own equipment and ready to go. After stopping to sign a few autographs on the way in to the clubhouse, it’s a quick sandwich, soda and chips to eat, a brief stretch and warm-up, a lot of joshing around with each other, a hats off listening to a scratchy recorded version of the Cuban National Anthem and then the seriousness of the ball game is underway. Some rituals are unfamiliar to American fans, such as the catcher and hitter shaking hands before the first pitch of the game and the umpires being served drinks by young women in mid-game. There are no scorecards, no advertising and no souvenirs. Just the game. The motto of Cuban sport is “Sport: the right of the people”. The motto is exemplified by the fact that games are often played on fields in small towns. Three years ago, more than 100 parks were used by Cuba’s 16 teams, although the number was recently reduced to fewer than 50 due to concerns about injuries sustained on sub-standard playing surfaces. The use of multiple venues addresses the challenges Cubans face in getting to the game and enables them to see their hometown heroes. We attended one game in the small town of Artemisa near the Pinar del Río province. Thousands of fans were seated on the concrete slabs that served as seats. Others watched their heroes from the seats of tractors and the beds of pickup trucks that were parked on the hill just beyond the outfield wall. Cuban baseball is truly a unique entity unto itself. It has survived a Revolution, a “special period,” the pilfering of its players (by the majors) and less than stellar playing conditions. May she long live into the future and continue to provide opportunities for sensational athletes to not only share their talents with the island’s inhabitants, but with the world as well. 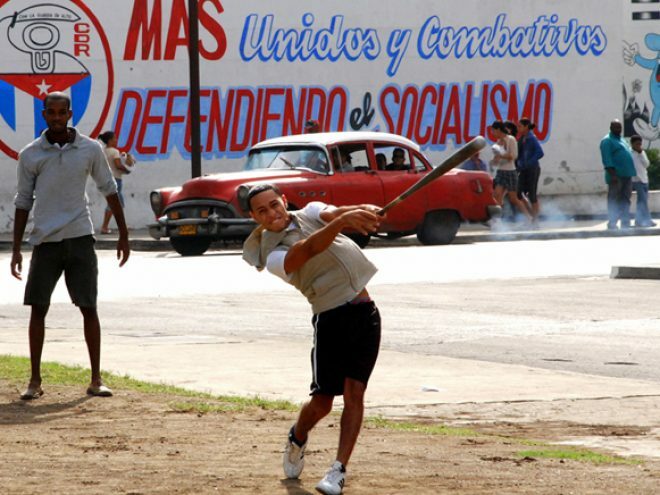 Viva Cuba Beisbol!